ASUS applied SROI to monetize the social value generated by public welfare activities, and further uses the monetary valuation method to assess environmental profit & loss (EP&L), which included environmental pollution into operational performance considerations. EP&L can measure the total cost and value of direct and indirect environmental impacts caused by the operation of the industry chain, and provide important reference for decision makers in future product development and supply chain management strategies. We plan to incorporate this method into the current procurement process. In addition, we actively implement the concept of green supply chain and hope to arouse the industry to face the issue of monetizing the natural environment. By working together with the supply chain, we could provide contribution to the sustainable development for humanity. 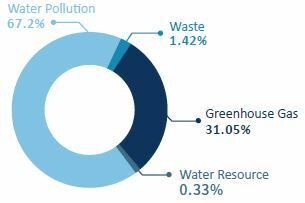 In the past, when enterprise assessed the environmental impacts of operations such as carbon emissions and waste, they could only survey on the amount of greenhouse gas emitted or on the amount of waste generated. This expression is clear to those with relevant knowledge. However, the general public, investors, and the manager without the background knowledge have no idea on whether the environmental impact is high or law. Through the monetary valuation on the impacts (i.e. greenhouse gas causes the climate change and further leads to the lost in agricultural industry or in ecology), different environmental impacts become comparable so that it could reflect the environmental net loss or profit of the operation to help the enterprise to review the sustainability performance. ASUS choose the industry chain of notebook computer and analyzed based on the Valuing Corporate Environmental Impacts: PwC Methodology Document published by PwC in 20151 and referred to the evaluating process of natural capital impacts in “Nature Capital Protocol” (NCP) posted by the Natural Capital Coalition (NCC)2 in 2016 to identify the environmental profit and loss in the following 4 tiers: mining and manufacturing of raw material, manufacturing of major components, OEM assembly, and ASUS operation. In view of the characteristics of manufacturing process of laptop computers, and based on the results from previous life cycle assessment projects, we identified that the environmental impact of the manufacturing process of laptop supply chain was primarily from the components manufacturing and energy and resources usage for product assembly, which included electricity usage, water used for manufacturing process, wastewater, and waste discharge. Therefore, the Project chose 4 environmental indicators, namely greenhouse gases emissions, water consumption, solid waste, and water pollution, for EP&L assessment. For example, in the past, only the number of tonnes of greenhouse gas produced by the operating activities was investigated. After applying the EP&L methodology, we can further calculate the social impact by climate change due to the emission of greenhouse gases, and consider the loss of the overall economic value such as the loss of the agricultural industry, the destruction of construction assets and the impact on the ecology caused by extreme weather events (such as drought or flooding) due to climate change. In other words, in the past, the "value" of a company's environmental impact, or the externality, was not considered. Calculating EP&L allows us to better understand the externalities (i.e., water consumption, water pollution, greenhouse gas emission and solid waste), and thus use the same monetary value (US dollars in this project) to measure these impacts and communicate with stakeholders. The overall monetary valuation assessment process is shown in the figure below. 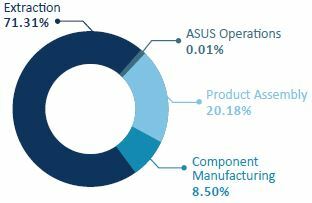 According to our analysis, the impact of ASUS laptop computers supply chain for the full 2016 was approximately US$347 million. The monetary valuation results of various environmental impacts at different stages are shown in the table below. From this project, we learn that in the production of ASUS laptop computer, mining and manufacturing of raw material had the most significant environmental impact in the context of the organization's operations and supply chain, and water pollution was the largest source among the environmental impact categories. The result of this Project enabled us to identify the environmental hot spot of the ASUS supply chain, proving that the priority considerations in the supply chain environment management were Tier 3 and the water pollution issue. Monetary valuation also provided ASUS with the maintenance costs for environmental impacts, and served as an important reference for the reduction strategy. In the next stage, the scope of the environmental profit and loss project will expand and include the calculation of monetary valuation of other products, including handheld devices, motherboards, desktop computers and monitors. At the same time, we will continue calculating the annual environmental profit and loss intensity of each product to confirm that the resources invested and the implementation of green product strategies in the supply chain environment management can achieve actual benefits, and gradually establish a complete supply chain environmental gain and loss assessment. On the other hand, the result of the Project highlighted the importance of externalities in addition to the traditional factors such as cost, quality, technology, delivery and service when choosing a supplier, so as to obtain the true life cycle cost (LCC), which is the new concept of the ISO 20400 International Sustainable Procurement Standard. In the future, ASUS plans to incorporate this method into its current procurement process, establish the sustainable procurement performance indicators of ASUS for the supply chain, and realize the vision of Total Impact Measurement and Management (TIMM) for the sustainable development of ASUS. The complete EP&L report can be downloaded from HERE.